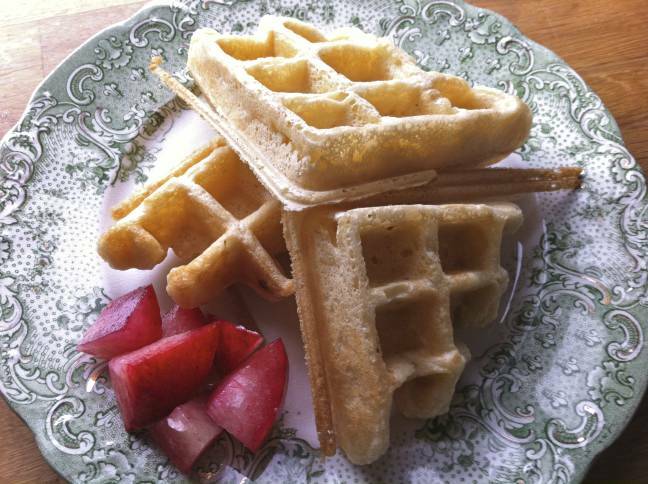 Posted on June 25, 2011 by e.
Why dont more breakfast places serve waffles? They are my very favorite breakfast food and I cant ever find them. Or when i do find them, they’re straight out of the freezer. Boo. Lazy. Gross. Save a buck and stay home and make these. 2 Eggs Separated, at room temp. Oil iron and then you plug your waffle maker in/turn on. Take out three bowls. One big one for dry ingredients, a smaller on one for wet and one to beat egg whites. Separate your eggs – whites go in the one bowl big enough for a beater to fit in. Yolks go in the mixing bowl for your wet ingredients. Beat egg whites stiff with a mixer and set aside. Whisk milk into your egg yolks and then add butter and vanilla. Combine Dry ingredients in the large bowl and mix well. This is the step where I obsess with my waffles staying crispy SO i run to the table and devour them before the humidity in the air makes them soft. You can just eat them at a normal speed. + I’m experimenting with the amount of fat in the batter for the crunchy thing. I had these PERFECT crispy waffles at a street vendor in Paris and now I’m on a mission to figure it out. I’ve used up to 3T Butter and thought that they could stand more… but then i felt guilty for putting so much butter in them that i changed it back to 1 T.
+ Also I’ve been wanting to experiment with vanilla bean instead of extract. Enter your email address to follow the pear and plum and you'll get an email when new posts are up.